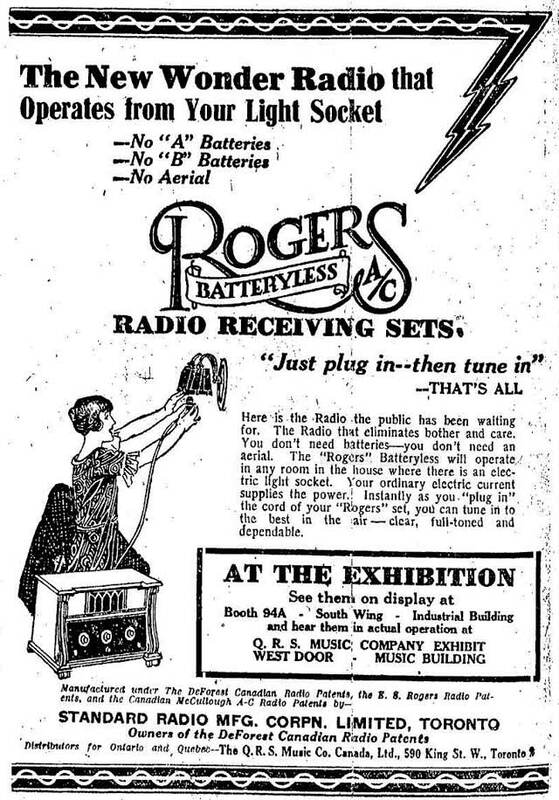 The first advertisement for the Rogers Batteryless radio, the Toronto Star, September 2, 1925. Little did the paper know that in a little over a decade, Edward Samuel Rogers, Sr. would revolutionize the emerging radio industry. Edward Samuel "Ted" Rogers, from the cover of Radio Wizard: Edward Samuel Rogers and the Revolution of Communications. The son of an oil executive, Rogers was a precocious talent. Using equipment at the family cottage on Georgian Bay, he is reputed to have learned of the outbreak of World War I before the Toronto media did. For several summers during his late teens, he worked for Canadian Marconi as a radio operator on passenger vessels sailing the Great Lakes. He offered technical assistance when the Toronto Star launched its radio station, CFCA, in 1922. In early 1924, Rogers and his father purchased the radio assets of the bankrupt Canadian Independent Telephone Company. With that done, Rogers threw himself into the task of producing a better radio. He wanted to find a way of powering a set using electrical alternating current (that is, AC—the same stuff that flows from the outlets in your house). At the time, radios ran on large, awkward rechargeable batteries. They ruined floors with acid leaks and produced an annoying background hum that often harmed reception. The trick was to devise a vacuum tube that could run on a home electrical system. Advertisement, the Toronto Star, September 9, 1925. 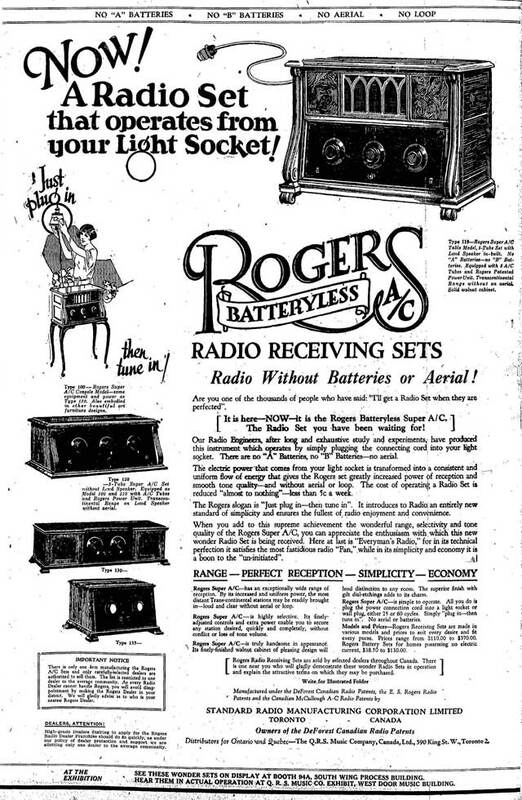 The following year, Rogers created both a commercially viable all-electric radio and an adaptor set that allowed existing set owners to toss away their batteries and plug into the nearest light socket. The Rogers Batteryless was unveiled to the public at the Canadian National Exhibition in September 1925 and was available in 17 Toronto furniture and radio stores by the end of the month. 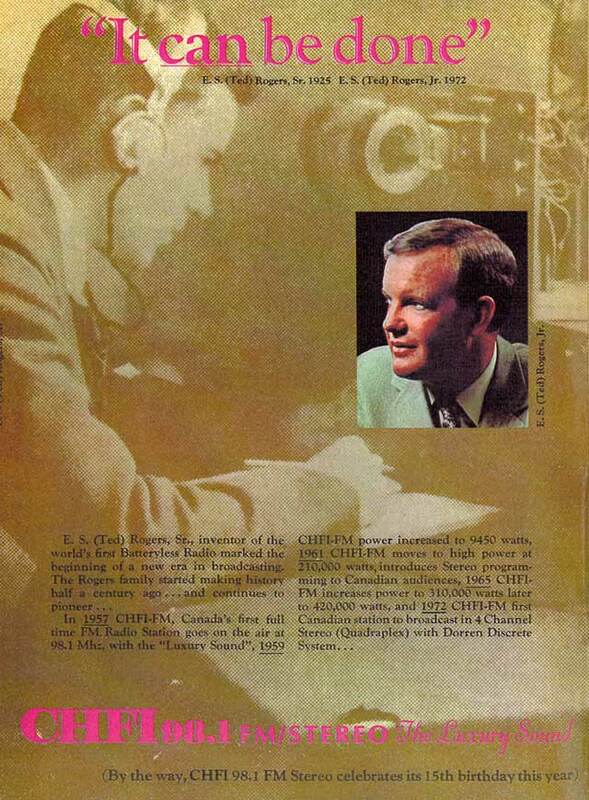 Rogers turned his attention to improving the quality of radio broadcasts. He received a station license in June 1926 and leased space in the old Massey Mansion at 515 Jarvis Street, then owned by five-pin bowling inventor Tommy Ryan. 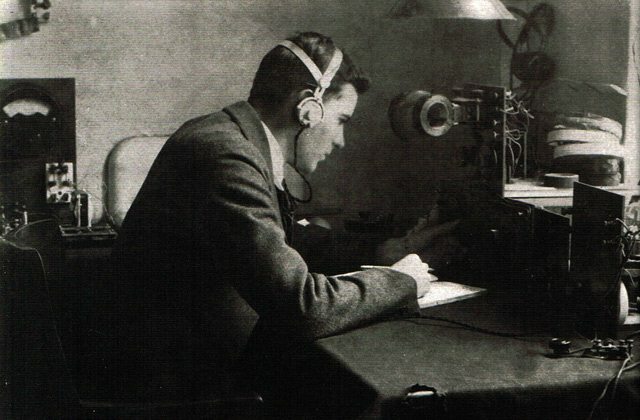 When CFRB, whose call letters stood for “Canada’s First Rogers Batteryless,” officially launched in February 1927, Rogers listened to the opening-night broadcast at home to ensure the transmission met his standards. The station boosted Rogers radio sales. Rather than sit back and enjoy the financial rewards of his growing radio empire, Rogers continued experimenting with new equipment in a basement lab in his new home on Glenayr Road in Forest Hill. Among his later achievements was a closed-circuit television system tested at Eaton’s College Street store in 1933. Advertisement featuring Ted Rogers, Sr. (background) and Ted Rogers, Jr. (foreground), Toronto Life, April 1972. What Rogers did leave behind was a young son who grew up and eventually made his own mark the communications industry. Ted Rogers, Jr. would need to build his empire on his own, as the family businesses were sold after his father’s death. The Rogers radio brand eventually wound up with Philips, who discontinued it in 1964. Additional material from Radio Wizard: Edward Samuel Rogers and the Revolution of Communications by Ian A. Anthony (Toronto: Gage, 2000), Relentless by Ted Rogers with Robert Brehl (Toronto: HarperCollins, 2008), the May 8, 1939 edition of the Globe and Mail, and the July 21, 1913 edition of the Telegram.